I found bright orange kumquats at the market made and used them to make kumquat syrup to combine with to soda water to make kumquat soda. The syrup is a wonderful, filled with thin slices of sweet kumquat. 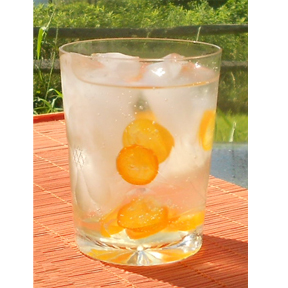 Savor the flavor of kumquats in a refreshing soda. Combine water and sugar in medium sauce pan over medium heat, stir to dissolve sugar, simmer for 2 minutes. Add kumquats and simmer for 5 minutes. Makes about 3 cups of syrup. Store in closed container in fridge. Fill glass with soda water and stir gently. Adjust amount of syrup to make a more or less sweet drink. 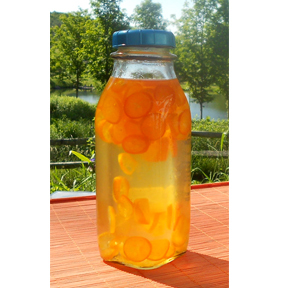 Kumquat syrup can also be used to flavor iced tea, fruit salads, or in cocktails. 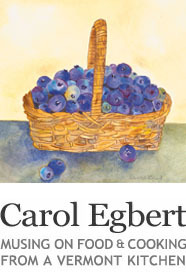 Carol- That looks like the most perrrfect bevvie for a hot summer night. As always, love all your posts and stories.